Valentine’s Day is a rough time for everyone. Let’s put it this way: we’re more Ralph Wiggum’s heartbroken self and less Kim Kardashian with her wall of flowers. Because some people have a few more problems than being salty at their desk on February 14 as their co-workers get very, very large bunches of flowers delivered, we thought we’d compile a list of 12 deliciously game-changing Valentine's Day date spots with a difference. Enter: The Hunger Project’s A Table To End Hunger, AKA a foodie initiative that is literally going to change the world. How does it work? Well, they’ve teamed up with a selection of Australia’s best restaurants to save you a (usually very tricky to lock down) seat—all you have to do is bid for it! So yep, turning your V-Day date into a noble act of charity is straight-up that easy: bid on a table, eat, change the world, and don’t forget to take your make up off before bed—all in a day's work, really. A word of warning, though, bidding gets intense. Here’s a sample of the delicious spots getting involved, so start bidding, people! Lovers of charcuterie and European fare rejoice because Pearl Café is about to become your new favourite spot. Located in the historic Woolloongabba district, Pearl Café sits tucked away in a terrace that’s all exposed brick and dim lighting—AKA, mega romantic—and a menu that will blow your mind. Italians know how to do love (we’ve all seen The Lizzie Maguire Movie), so it makes pretty perfect sense to us that you should head to Bucci for loved-up Italian feed. Order one of their famous Aperol Spritz, their epic crab linguine, and finish off with their insanely good chocolate cake and thank us later. River views, the open air, share plates, and world-class cocktails? Sign. Us. Up. Get bidding on a table at Riverbar And Kitchen (who don’t take normally bookings!) if you’re after the most ‘grammable date of all time. If you’re an Aussie and you don’t have Atlas Dining on your bucket list of eats, we have some questions for you. Namely: what the hell, man. This place is epic. If you’re wondering about the name, the restaurant literally serves as an atlas to the world’s cuisine. The menu changes three times a year to focus on a different cuisine, so each time you go back you’ll be treated to a whole new experience. If hole-in-the-wall Italian is your vibe, get bidding on a table at Vaporetto Bar & Eatery, stat. For one, the door is home to sign that reads ‘Come on in! It’s warm and cosy inside’. All pasta is made in-house, from scratch—so there’s the question of what to order answered. Peruvian food may be pretty under the radar, but Pastuso is proving that we need a whole lot more of it on the Aussie foodie scene. Pop by for their ceviche—they’re technically a Cevicheria, so it’s their specialty—and sip on pisco and pat yourself on the back for organising the best Valentine’s Day ever. St Kilda’s Babu Ji is the fanciest Indian fare you’ll ever eat. Our pick is to start with the butter chicken, aloo baingan and naan bread, or even try the chef’s delicious handpicked set menu for the full works. Look, as far as views go, Catalina is probably the best in the business. We’d bid our kidneys on a table here as the sun sets with a cocktail, just quietly. The seafood-heavy menu is ridiculously tasty, and there’s burrata, too, which pretty much says it all. Chiswick has date night written all over it. With a menu that is comprised of a whole heap of ingredients they grew themselves, the love is real at Chiswick. Plus, the lamb served comes direct from Matt Moran’s farm—amazing. Okay, okay—we said Italians know romance, but can we really talk about one of Sydney’s best French restaurants without calling out the fact that the French are romantic AF. And yes, their escargot is delicious. Thank you, Restaurant Hubert. 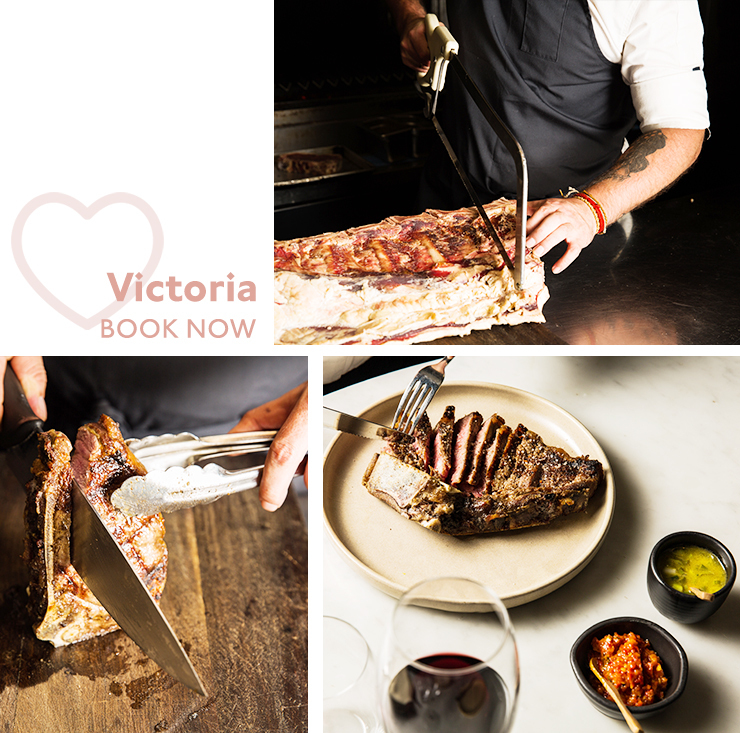 Newbie Perth restaurant Ascua offers up a whole lot of Spanish sophistication and this V-Day you can treat yourself to their five-course degustation dinner with matched wines, all while seated in one of their ultra luxe booths. This article is packed-full of superlatives—we know—but TBH, Bib & Tucker is seriously one of the prettiest restaurants in the country. Let’s just say, if you manage to nab yourself a table here for V-Day you’ll be the most popular S/O in the world. The menu is diversely delicious—you can order chargrilled kangaroo rump in the same breath as Korean spiced short ribs #LivingTheDream. Wildflower is a big f*ck you to everyone who has ever said Australia’s best restaurants are in Melbourne and Sydney. Seriously, this place is good enough to make us say amazeballs. For a start, dishes come adorned with real wildflowers, and they’re plated up so well your Instagram story will be at least two hours long. Oh, and it’s a hotel so make it a stay-cay and call it early: this will be the best Valentine’s Day ever. When it comes to Valentine’s Day, sometimes the OG is unbeatable. The Thai inspired menu at Long Chim is seriously THAT good, and the cocktails… oh, boy. We’d suggest a killer dish to order, but really, you can’t actually go wrong here. So… go wild! Feeling hungry yet?! So are the 815 million (plus!) people who are going hungry this Valentine’s Day. Click below to help us get closer to ending world hunger. Image credit: Hayley Willamson, Federica Portentoso, and Nancy Hanna for The Urban List.